Home › The Bible Re-Viewed › Where is the Garden of Eden? First, let’s read the story. We’ll include only the parts about the garden itself. You can read the entire story in Genesis 2–3. On the day that the Lord God made the earth and the heavens, when no plant of the field was yet on the earth and no herb of the field had yet sprung up—for the Lord God had not caused it to rain upon the earth, and there was no one to till the ground; but a mist would rise from the earth, and water the whole face of the ground—then the Lord God formed man from the dust of the ground, and breathed into his nostrils the breath of life; and the man became a living being. And the Lord God planted a garden in Eden, in the east; and there he put the man whom he had formed. Out of the ground the Lord God made to grow every tree that is pleasant to the sight and good for food, the tree of life also in the middle of the garden, and the tree of the knowledge of good and evil. The Lord God took the man and put him in the garden of Eden to till it and keep it. And the Lord God commanded the man, “You may freely eat of every tree of the garden; but of the tree of the knowledge of good and evil you shall not eat, for in the day that you eat of it you shall die.” . . . The woman said, “The serpent tricked me, and I ate.” . . .
To get the picture clearly in our mind, let’s highlight some key points in the description. First, notice that God created Adam before the garden of Eden existed. Adam was not created in the garden of Eden. Unlike the first Creation story in Genesis 1:1–2:3, in which God creates plants on the third day, and human beings are the very last thing God creates, in the second Creation story Adam—a Hebrew word that means “humanity”—is the very first thing God creates. It is only after God has already formed Adam out of the dust of the ground that the Lord God plants a garden in Eden, and places the man there. This different order of creation has a specific spiritual significance, which will have to wait for another article. Preachers who ignore what the Bible says and pretend that these are just two different versions of the same story are doing damage to the Bible’s literal meaning and destroying its spiritual significance. God did not make a mistake in opening the Bible with two very different Creation stories, one right after the other. The Bible says that God planted a garden in Eden. But more specifically, it says that God planted a garden in Eden, in the east (Genesis 2:8). And when God drove the humans out of the garden of Eden, God placed a guardian at the east of the garden (Genesis 3:24). The east is mentioned one more time in the description of the garden, when it says in Genesis 2:14 that the Tigris flows east of Assyria—or perhaps east of the ancient city of Assur, which was located on the west bank of the Tigris, and was the original capital of Assyria. None of the other cardinal directions appear anywhere in the story. It is worth noting, then, that the garden of Eden is strongly associated with the east. We know where the Tigris and Euphrates rivers are. This is why Eden has traditionally been placed in the area where the Tigris and Euphrates rivers meet, just north of the Persian Gulf. However, the rivers Pishon and Gihon don’t fit into this schema. There are not two more rivers joining where the Tigris and Euphrates meet. Besides, although the text of the Bible isn’t crystal clear on this point, based on similar scenes elsewhere in the Bible such as the river flowing out of the Temple in Ezekiel 47:1–12 and the river of life flowing from the throne of God in Revelation 22:1–2, it makes the most sense to read the story here in Genesis 2 as describing a river that flows out of the garden of Eden and then divides into four rivers that continue to flow downstream from there. The problem is, nowhere in the world of the Bible—a region stretching from Media and Persia (present day western Iran) in the east to Egypt and Asia Minor (present-day Turkey) in the west, and from the Persian Gulf and the Red Sea in the south up to the Black Sea in the north—is there a place where four great rivers flow out of a single river. Even the Tigris and Euphrates don’t do this. From being two rivers they join into one just before flowing into the Persian Gulf. That’s why there has been a great debate over the years about these rivers. Various Christian scholars have made various conjectures about which rivers are meant by the Pishon and the Gihon, most of which are not very convincing. Many Christian literalists simply throw up their hands and say that the Great Flood rearranged earth’s geography so that the rivers are no longer where they used to be. However, though floods may fill in some areas with silt, and they may cause giant mudslides, they don’t move whole mountain ranges to entirely different places, nor do they move the channels of major rivers to entirely different places. Besides, the Bible doesn’t say that the geography of the earth changed after the Flood. This is pure speculation and human invention in an attempt to cram the Bible into the straitjacket of fundamentalist dogma. The Pishon is still the most difficult to identify. Based on its description of flowing around the land of Havilah (location unknown), where there are gold and precious stones, it is most likely associated with the region of the Arabian peninsula east of the Red Sea, or perhaps the region of Africa west of the southern part of the Red Sea, in present day Ethiopia and Eritrea. Since there is no major river in this area, some have speculated that it refers to the Red Sea itself. And yet, it is described as a river, not a sea. Others have more fancifully identified the Pishon with rivers of India such as the Indus or Ganges. But this is unlikely, since India was beyond the boundaries of the biblical world. The general picture that emerges is of rivers branching out in various directions in the regions around the land of Canaan, which is roughly equivalent to present-day Israel, Palestine, Lebanon, and parts of western Syria. This is the basis on which Swedenborg says that the garden of Eden was in the land of Canaan. We’ll get to that later. For now, it is best to understand that the description of the four rivers in Genesis 2 does not correspond to any actual configuration of rivers in the world of the Bible. This is one indication that the Creation story was never meant to be taken literally. Next, notice that the garden of Eden is a garden of trees. After the initial mention that there were no plants or herbs growing from the ground at the time God formed Adam, the only plant life mentioned in the entire story of the garden of Eden is trees—except where God is informing Adam of the consequences of his actions, and what his life would be like outside of the garden of Eden. Specifically, when it describes God creating the garden of Eden, it says, “Out of the ground the Lord God made to grow every tree that is pleasant to the sight and good for food, the tree of life also in the middle of the garden, and the tree of the knowledge of good and evil” (Genesis 2:9). God tells Adam that he is free to eat from every tree of the garden except for the tree of knowledge of good and evil (Genesis 2:16–17). The serpent tempts Eve to eat from the tree of knowledge of good and evil, and both she and Adam do so (Genesis 3:1–7). When they realize they have made a mistake, and are ashamed about it, they hide from God among the trees of the garden (Genesis 3:8). After their disobedience, God expels the man, or humanity, from the garden of Eden, and places a guardian to prevent them from gaining access to the tree of life (Genesis 3:22–24). The garden of Eden is not a vegetable garden, nor is it a flower garden, nor is it fields of grain. The garden of Eden is an arboretum. The lives of the human inhabitants of the garden of Eden revolved around trees. Adam and Eve were originally arborists. Their food also came from the trees. Only after Adam had disobeyed God does God tell him he will eat, not from the trees, but from the plants of the field, through hard labor (Genesis 3:17–19). Did you notice it? Verse 9 says that God planted the tree of life in the middle of the garden. Then it says God created the tree of knowledge of good and evil, without specifying its location. God put the tree of life in the center of the garden. Eve put the tree of knowledge of good and evil at the center of the garden. And finally, after Adam and Eve disobeyed God by eating from the tree of knowledge of good and evil, God banished them from the garden of Eden and posted a guardian to prevent them from eating from the tree of life and living forever. There is no mention of Adam and Eve ever eating from the tree of life; only from the tree of knowledge of good and evil. In other words, they ate from the tree of knowledge of good and evil instead of eating from the tree of life—which was one of the many trees that God had originally allowed them to eat from. Ever afterwards, except in a few poetic passages in the book of Proverbs and in the apocryphal and deuterocanonical books of 2 Esdras and 4 Maccabees, the tree of life is absent from the Bible story. No one has access to it, and no one eats from it. At length, after thousands of years of pains, sorrows, struggles, and battles throughout human history, God says that those who conquer will once again be allowed to eat from the tree of life. Once humanity had disobeyed God and been banished from the garden of Eden, it would be an eons-long battle before we would once again have access to the tree of life, its life-giving fruit, and its healing leaves. As I said earlier, Swedenborg focuses largely on the spiritual meaning of the garden of Eden. However, he did have his own idea of where the garden of Eden was located: in the land of Canaan. See also Secrets of Heaven #4447:2, where Swedenborg explicitly states that the garden of Eden was in the land of Canaan. Though Rev. Montsho’s question was not about the spiritual significance of Eden, all of this will make more sense if I give a thumbnail sketch of the symbolism of the garden of Eden and its rivers. Swedenborg says that these early stories in Genesis were never meant to be taken literally, but were myths or symbolic stories about our spiritual origins. These stories come alive when we learn what spiritual realities they refer to. In their deeper meaning, the two Creation stories of Genesis 1 and Genesis 2 refer to the earliest development of spiritual awareness among humans. We now know that the roots of humanity stretch much farther back than the 6,000 or so years that the Bible story covers if we read it literally. Even Swedenborg was not aware of the evolutionary history of humans, since he lived before the age of Darwin. And yet, his explanation of the meaning of the first chapters of Genesis dovetails well with our present-day knowledge that at some point in human evolution, homo sapiens began to have religious beliefs. This is evidenced, for example, by their beginning to bury their dead rather than just leaving them on the surface of the earth to be eaten and to decompose, as other animals do. The Creation stories of Genesis are symbolic stories of how humans first became aware of God and spirit many thousands of years ago, and in that way rose up from being mere animals to being human beings. The east symbolizes love, and especially the love of God. The east is where the sun rises, and the sun is an ancient symbol of God. The garden with its trees symbolizes the developing knowledge and intelligence of these early humans. The tree of life symbolizes our connection with God, from whom our life comes. The tree of knowledge of good and evil symbolizes a desire to decide things for ourselves based on our own understanding of things rather than trusting in God for our understanding of our life and path. The serpent symbolizes knowledge that comes from our physical senses, and a general orientation toward trusting knowledge that comes from external, physical sources rather than trusting insight that comes from internal, spiritual sources. The rivers that flow out from the garden represent the living truth of spiritual awareness and intelligence that flows out into all areas of our life when we are focused on God and spirit. Walking with God in the garden represents the living, personal relationship with God that these early humans enjoyed. Being expelled from the garden represents the loss of that early loving, innocent, and wise relationship with God when we chose to do things our own way based on the appearances shown to us by our physical senses instead of following the guidance that God and the angels give us from within. In short, the story of the garden of Eden is a symbolic story of the first spiritually advanced human society in mythic, prehistoric times. This early culture, which Swedenborg calls “the earliest church” or “the most ancient church,” was motivated primarily by love for God. Its people had a highly developed understanding of God and spirit. They are the cultural source of our ancient myths of a golden age in the primeval times of humanity. These stories, rich in spiritual symbolism, were originally passed down orally from ancient times before being written down many generations later. Though outwardly these early humans would have looked simple, even primitive to our eyes, inwardly they had a living and vibrant relationship with God and with the angels of heaven. Swedenborg goes into much more detail about these early, spiritually enlightened humans in his explanation of the spiritual meaning of Genesis in the first volume his great work Secrets of Heaven (Latin: Arcana Coelestia). In answer to Rev. Montsho’s original question, Swedenborg did not provide a detailed geographical description of Eden because he did not believe it was a geographical place. Instead, he saw it as symbolizing an early, spiritually aware human culture. Beyond locating that culture in the land of Canaan (greater Palestine), he focused entirely on explaining the spiritual meaning of the garden of Eden. They did, and their eyes were opened, and they saw trees with plenty of tasty fruits, twined around with vine tendrils, their tops bending with fruit toward the tree of life in the middle. These trees were planted in an unbroken row that went out and around in steady circles or spirals like an endless helix. It was a perfect helix of trees. Species after species followed one another according to the excellence of their fruits. The first sweep of the helix started at a considerable distance from the tree in the middle, and in the interval danced a sparkling of light, so the trees of the spiral gleamed with a steady, uninterrupted brightness from the first one to the last. The first trees, called trees of paradise, were the finest of all, luxuriant with the plumpest fruits, and they have never been seen before, because they do not grow and cannot survive in the soil of the natural world. Next followed olive trees, then vine trees, then fragrant trees, and finally trees with good wood for woodwork. Here and there in the helix or spiral of trees were seats made by training and interlacing the young branches of the trees behind the seats, and they were enriched and ornamented by their fruits. In this perpetual cycle of trees were openings that led to flower gardens, and from there to lawns laid out in fields and terraces. The angel was glad to hear this. 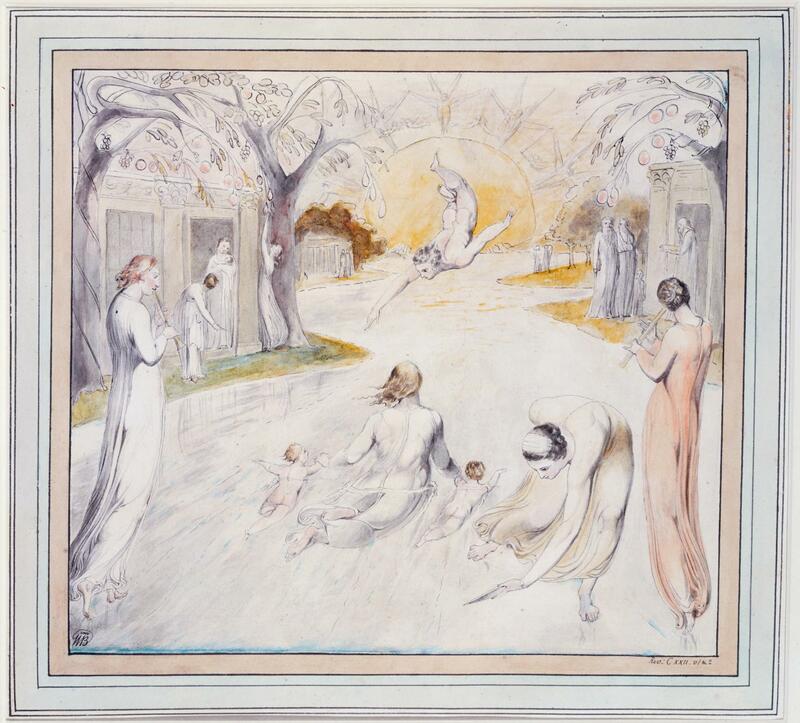 “All the gardens in our heaven are forms or images that represent heaven’s blessings at their sources,” he said, “and the influence of these blessings lifted up your minds, so you exclaimed, ‘Why, it’s a model of heaven!’ But people who do not receive that influence see these paradises as nothing but forests. Everyone who has a love of usefulness receives that influence, but people who are in love with fame—and not because of usefulness—don’t receive it.” Then he explained and taught what the different things in the garden represented and stood for. ‹ War, Military Service, Violence, and Self-Defense: What’s a Christian to Do? It’s wonderful to hear from you! We hope all is well with you and your extended family. Thank you for your kind words. I also think often of the Mitchell clan, and of you in particular, and remember those times around the table at the Bridgewater Church. These are my fondest memories of my decade there. I particularly remember that you, Anne, didn’t feel you always had to agree with me. And when you offered a different perspective, it often led to some of our best discussions. I’m glad that time is still bearing fruit in your life. While it’s not quite the same, I hope the articles here are also helpful to you on your spiritual walk. I am currently working on editing a first volume of articles from the site for publication in printed book (via POD) and eBook formats. Please give our best wishes and Christmas greetings to the rest of your family. Jesus and the Holy Spirit are “personas” of the Father. A persona is a mask held by an actor, not a separate person. I can watch a solar eclipse through an arc welding mask and not be harmed. So Jesus and the Holy Spirit are masks that filter the intensity of the Glory of God to protect people from being destroyed and also work in reverse to block the view of our sinful nature from the Father because HE can’t stand to look upon sin. Moses asked God to show him His Glory and God responded that no one could see His face and live, but He was wiling to show Moses His “good side.” So Moses spoke to God face to face as friends do but the rest of Israel was afraid/untrusting of that arrangement and had to settle for dreams and visions. Phillip asked to see the Father, so Jesus stepped out of character for a moment and reminded him that He (Jesus) is the Father. This was a concept that seemed to trip up even members of the inner circle of His disciples. This concept of personas is central to why Jesus is necessary. The angels in Heaven see the face of the Father always, so they are different from us. We who are human cannot approach God on our own, His Glory would destroy us. He, in turn, cannot look upon sin, so He can’t just show up in His complete person to seek to save us. A veiled view is the only workable arrangement. That is also why we have to forgive others. He has to overlook our sins to save us, so we must also grant the same to each other so we can all live together in peace in the same place. Hear Oh Israel, the LORD our GOD is ONE. Thanks for you thoughts. The original meaning of the Latin word persona as “mask” shows that the Trinity of Persons in its origins is a modalist conception of God. And if it had stayed there, it would not have been as destructive a doctrine as it has turned out to be. It is also not true that God cannot look upon sin. Throughout the Bible God is continually described as looking upon and seeing the sins of the people, and taking action to punish and correct them. The idea that God cannot look upon sin is an utterly false, unbiblical human invention, designed to support and justify the false substitutionary atonement theories of Protestantism. God is perfectly capable of looking upon sin, as we know from hundreds of passages in the Bible.